Introducing a lady who is a Fountain of knowledge and at the top of her game in the wedding and events industry. She is based in Suffolk and is the Venue Director for the prosperous Hengrave Hall and thriving All Saints Hotel. She is…… Hannah Bibby! Hannah has really taken up the reins in her role and is revelling in her sweet smell of success. It’s a pleasure to know such a lovely lady and accomplished individual. Where do we start…. I must say, All Saints Hotel looks absolutely stunning. How’s it going here? Thank you – the transformation that the owners have done really does make the hotel unrecognisable from what it was when they purchased it in October 2015. Having launched the weddings side of the business only eight weeks ago we are thrilled with the response and our books are already filling for next year which is just fabulous. Looking back, it was August 2009 we first met and got involved with you and the team at Hengrave Hall. How are things at Hengrave going? Time flies when we you are having fun……. it’s unbelievable to think back to Hengrave eight years ago when I joined with two weddings booked in to where it is now. Hengrave is an extremely special place for many people and the team has grown hugely in the past years – with Catriona and Shona supporting me day to day. We are proud to continually offer a very personal service and are there for our brides seven days a week when they need us. The beauty of Hengrave is every wedding is different; different couples, different colours, different guests, different clients and different requirements and that’s what makes it fun and exciting for every wedding. You don’t realise how well you to get to know your clients, but working with them (some for over two years in their build up to their day) means we are like friends by the time the wedding comes around. 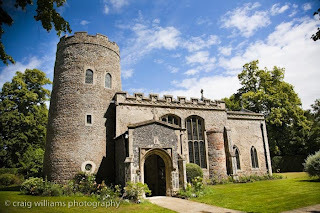 We all still get very emotional when those doors open to the church or banqueting hall for the entrance of the bride. It makes you very proud and we do think we have the best job to make peoples dreams come true. For our readers who don’t know, we are your exclusive recommended supplier for DJ and Lighting Hire. What do we have to offer that you like and your clients want? You are indeed and have been for the past 8 years!! We are so lucky to have the Dreamwave Team on board with us and we know our couples absolutely love working with you and the creative things you do! We hear so much amazing feedback all the time. I love the way you are ahead of the latest trends and the way lighting has evolved over the last 8 years is crazy. Hengrave lends itself to such stunning lighting to really show off the amazing architectural features of the Grade 1 * listed mansion. My firm favourite still has to be the stunning festoon lights hanging in the courtyard. Of course all of your DJ’s must get a special mention as many a FABULOUS night is had on our dance floor thanks to Dave, Paul, Spikey, Martin, George and Darren! The guys always say what a great night they have when DJing in your Banqueting Hall with you. That room has something about it, doesn’t it? It does, and I just love the way it gets transformed, particularly after people may have had a civil ceremony in the Banqueting Hall. Once those doors close (whilst guests sip champagne on the West Terrace) the team come in and transform the room, with the black and white dance floor laid and gorgeous different lighting options. The extremely high vaulted ceiling and stunning stain glass bay window reminds you of the age of the house but with the modern twist of lighting and the dance floor it really does bring the whole room to life! We love it…! As you know Dreamwave Events Lighting and Décor has completely rocketed and flying high especially at Hengrave. What areas do you like to see lit up? It has indeed. I am not surprised. As I said before its because it compliments the Hall so well. As you know I LOVE the Courtyard, but the West Terrace must get a special mention particularly if our couples opt for fireworks, seeing the shepherds crooks line the path with festoons or fairy lights whilst the fireworks are going off in the distance really is an amazing sight (and great photo!). I do also love the personalised gobos you have done for some of our brides on the wall in the Banqueting Hall. It just completely personalises it and I think its a stunning touch. And how can we not talk about your wedding. Eeeeek! How are your plans going? Can we give our readers a sneak preview of what we are providing? Oh, it has come around so fast. I am so excited and so lucky to be working with many of our recommended suppliers at Hengrave….. Paul and Dave have been absolutely amazing from our first meeting in late January when we had ideas flying around too now seeing it all come together. We have a Whatsapp group where we bat ideas around and they keep me posted on a couple of the surprises they are kindly sorting!! I am desperately trying to keep lots of things a secret and I don’t know who is reading this…. but there is a big focus on the courtyard for the early part of the evening after dinner, before the dancing. I know the guys have got some brand new bits which are launching then which I am sworn to secrecy about! As you can tell I am soooo excited!! “Twinkle twinkle little star, point me to the nearest bar!”. Yes, we have popped the champagne cork and celebrating in style here at Dreamwave Events HQ. Join our beanfeast as we mark the occasion with wine and sweet words, well, truth be told just sweet words (wine will come later) – by reading my latest post on how we have featured in ROCK MY WEDDING! Truly exciting times for our team of misfits. Sonia and Amr’s day was absolutely amazing! A huge shout out to Katrina Otter, their gifted wedding planner, who organised the whole day with pigeonhole perfection. 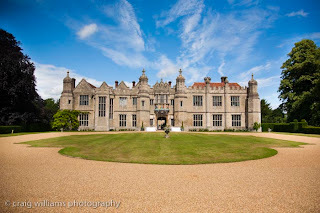 The venue; the elegant Hengrave Hall where you see the perfect blend of a multicultural wedding in a classic English setting nestled in the Suffolk Countryside. There were so many amazing aspects of the wedding, contributed by an array of talented suppliers that resulted in a wondrous wedding that will blow you away! Of course, I am going to focus on our side of the coin but would like to give a loud applause to everyone that made the day a success. Photo (above) courtesy of Modern Vintage Weddings. Sonia and Amr’s reaction when they first see their Custom Gobo Projection translated from their Monogram illuminated on the wall at Hengrave Hall. Sonia and Amr wrote: “We had a bespoke monogram created for our stationery which was then incorporated into various elements of our day, including a projection above our dance floor (courtesy of Dreamwave Events who also provided outdoor lighting throughout the grounds of Hengrave Hall). ” (Rock My Wedding). The image (courtesy on Modern Vintage Weddings) above is taken in the Banqueting Hall at Hengrave Hall. This illustrates Sonia and Amr’s initials in illumination with their custom made Gobo Projection during their ceremony. The Gobo projection was also admired during their wedding’s evening party. We also provided our Ivory Carpet/Aisle Runner. Everyone loves a cracking firework display and I am no different! If you add a bit of Dreamwave Events expert radiation with the pyrotechnic display by Fully Fused Fireworks; This can only result scenic wonderment and a fantastic photo opportunity. Another photo (above) provided by Modern Vintage Weddings. This beautifully shows our Hanging Votive Walkway on the West Terrace at Hengrave Hall. It was a pleasure to be part of such an awesome day and I particularly loved the continuity and personalisation of the monogram used throughout the day. To find out more what we have to offer Contact us. We also have a dedicated lighting brochure for Hengrave Hall. Again, I would like to say a humongous thank you to Rock My Wedding for featuring our services and to Katrina Otter for her recommendation.